In 1979 Douglas Hofstadter shot to fame with his book Gödel, Escher Bach. He realised, however, that readers weren't picking up what he thought was one of its main messages, that is the parallel between Gödel's incompleteness theorem creating metamathematics within mathematics itself, and the emergence of mind from inanimate matter. In I am a strange loop he gives a more direct explanation of this link. One problem which has to be faced with anyone looking at the nature of human awareness, no matter what philosophy of mind they prefer, is what other entities can be thought of as possessing such awareness. That your pet dog is away will be fairly obvious to you, but what about the turkeys of which large numbers are killed in order to be eaten? And if they are aware then what about ants and mosquitoes? And then what about the thermostat on your wall? Hofstadter concludes that such awareness - the existence of a soul if you will - is not an all or nothing matter, but is rather a matter of degree. He whimsically invents a unit of soulness, the Huneker, from a comment by James Huneker that some of Chopin's works should not be attempted by 'small souled' musicians. Hofstadter is proposing a physicalist philosophy of mind, that is to say that when he talks about the soul it is not to be considered a separate entity, but rather depends upon the workings of the brain. Thus there is an underlying mechanism leading to an emergent property. But he warns against the tendency of seeing the underlying system as where things are 'really' happening - it is important to see the emergent entities as being just as real as the underlying ones. But to get to Hofstadter's idea of the mind more is needed - some sort of self referent loop. As an example of this he looks at various feedback loops, for instance the result of pointing a camera at a screen which is showing the output from the camera. 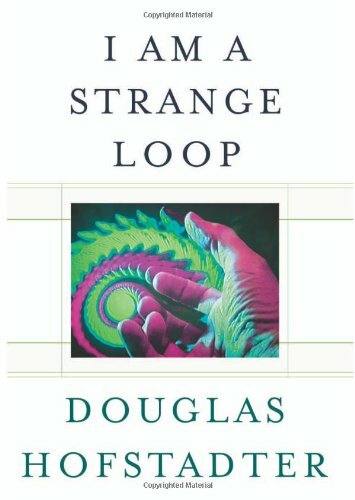 These loops are still not quite strange enough - for that Hofstadter needs to move on to the work of Kurt Gödel. In one chapter Hofstadter considers a hypothetical situation where English and French people might have different inner experiences of the same colour, without anyone being aware of the fact. In a later chapter, in describing the sensation I know as 'pins and needles', he mentioned that a cartoon character called 'Dennis the Menace' described it as 'having ginger ale in his leg'. I wonder if Hofstadter realises that the experience of imagining 'Dennis the Menace' is likely to be very different in British and American readers. Bertrand Russell was well aware of the paradoxes of self-referent statements, and in Russell and Whitehead's Principia Mathematica they introduced an elaborately hierarchical 'theory of types' to exclude such paradoxes. But there was a serious problem. What Kurt Gödel realised was that things from higher levels of the hierarchy could be encoded in the lower levels. In particular mathematical statements and proofs could be encoded as numbers, so talking about mathematical proofs could be disguised as talking about numbers. This led to Gödel's famed incompleteness theorems, which demolished the idea of reducing mathematics to some sort of mechanical computation. Hofstadter gives lots of analogies of this type of mixing of levels, for instance of how a message within a play might turn out to have particular relevance to the audience. He also emphasises that this connection can only be seen 'from the outside'. I'm not sure whether these analogies will help you to understand Gödel's theorems, but they do help to illustrate what Hofstadter means by a 'strange' loop. Having looked at how the self in terms of the underlying system in which it emerges, Hofstadter goes on to examine the self on its own level, for instance how the idea of self, and hence the self itself, develops in a child. In particular he looks at how our self isn't necessarily wholly contained within our brain. He invents an imaginary place, twinwirld, where people occur in pairs, and it is the pair of bodies which is thought of as making up the self. He then goes on to show how our selves can be thought of as being made up of bits of the selves of the authors of books we have read, and of the composers of music we like, and of course of our friends and others who make an impression in our lives. Thus he reasons that, even in his physicalist philosophy of mind, we don't just go out like a candle when we die. When Gödel, Escher Bach first came out I knew that it was a book that I should read. In fact I reasoned that it was so much my sort of book that it was an obvious choice for anyone wanting to buy me a birthday or Christmas present. Unfortunately those buying presents for me didn't realise this, and so it was a long time before I actually got round to reading it. When I did I found that I had met a lot of the concepts introduced in other books published after it, and so it didn't have quite the same effect that it would have done if I had read it straight away. Hence I was determined not to make the same mistake with Hofstadter's new book, and made sure I read it as soon as I could. While I would say that this book doesn't have the same sort of 'must read' status of GEB, if you have read that book and want to find out more then this is an obvious choice. The book is written in an easy to read style with plenty of examples of how Hofstadter's ideas relate to his own life, and his ideas of a self occupying more than one body are likely to interest a wide readership. One can also contrast the use of Gödel's theorem to justify a physicalist philosophy of mind with the work of those such as Roger Penrose, who use it in arguing for an opposing philosophy. If you read this book then you're likely to find plenty of stimulating and thought-provoking material.